As you likely know, while one can install Windows 7 from an external hard drive, one can’t install the same to an external hard drive with default settings. For all those users waiting for a good workaround to install Vista, Windows 7 and Windows Server 2008 R2 to an external hard drive, here is the complete solution. Even though Windows recognizes and displays the USB hard drive in the installation screen, it doesn’t allow you to install Windows on the same. When you attempt to install Windows 7 on an external drive, you get “Windows cannot be installed to this disk” error. So, if you want to install Windows 7 on an external hard drive, you need to follow the steps given below. 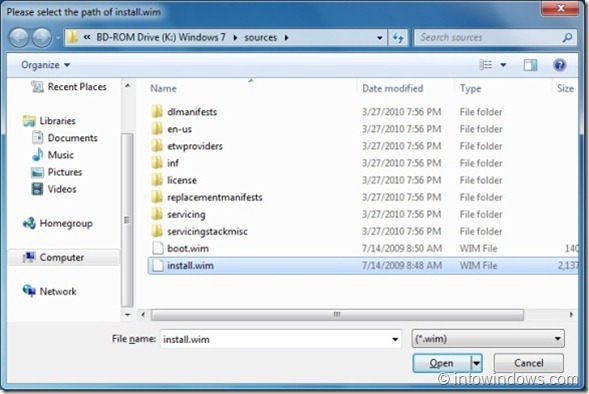 The procedure is simple, but you need to install Windows Automated Installation Kit (WAIK) first to get some files. We would like to thank fujianabc @ boot-land forum for this workaround. NOTE: Make sure that you have a minimum 15GB of free space on your external hard drive before starting the procedure. Although we are not going to delete the contents of external hard drive, we recommend backing up your external hard drive contents before trying this guide. Step 1. Create two folders named Windows Files and WAIK Files on your desktop or any other drive which has a minimum of 5 GB free space. Step 2: Download the ZIP file from here and extract the contents to the WAIK Files folder. Before starting the actual installation procedure, you need to have three files: Bcdboot.exe, Bootsect.exe, and Imgex.exe. These files can only be obtained by installing Windows Automated Installation Kit for Windows 7 on your Windows PC. 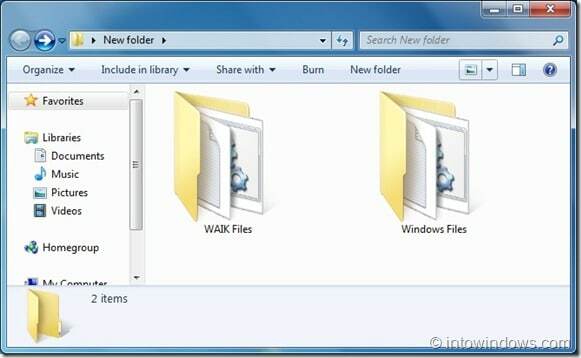 After installing WAIK, simply search for these files in the Windows installation drive to get them. Once you have these three files, copy them to WAIK Files folder that you have created in the above step. Step 3: Copy all the contents of the Windows 7 installation DVD to the Windows Files folder. Step 4: The next step is to run the Installer.cmd file as Administrator (Right-click on installer.cmd and select run as administrator). In the first screen, you will be asked to press Enter to continue. 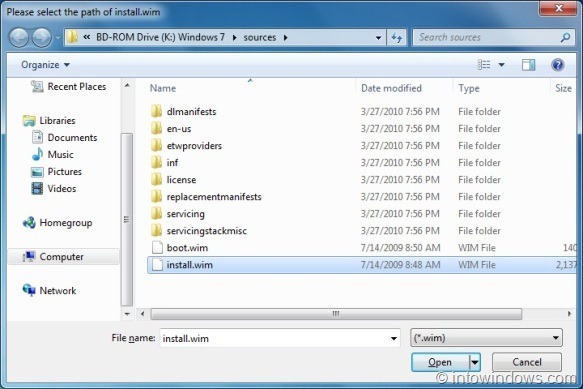 Step 5: Press Enter key to browse to the install.wim file present in the Windows Files folder. The Install.wim file can be found under Sources folder (Windows Files/ Sources/ install.wim). Step 6: Now, you need to select the Windows 7 edition that you want to install on external hard drive. You can select the edition by entering the index number shown on the screen. For example, type “5” (without quote) and hit Enter key to select Ultimate edition. Step 7: The next step is to enter your External drive’s drive letter. Enter the drive letter (ex: L) and press Enter key. Step 8: Now, type in the drive letter of your ACTIVE partition and hit Enter key. Generally “C” is the active partition. You can find the active partition by opening the Windows Disk Management tool (type diskmgmt.msc in Start menu search area and hit enter to launch it). Step 9: Finally, the installer will ask you the drive letter that you have entered to install Windows 7 is a USB hard drive or not. As you are installing Windows 7 to an external hard drive simply type “Y” without quote and press Enter key. Finally, click Enter key again to start extracting the Install.wim files. This might take a few minutes. Once done, you will be asked to reboot your PC to continue the normal Windows 7 installation procedure. Step 10: Reboot your PC and follow the usual Windows 7 installation procedure to complete Windows 7 installation on the external hard drive. Your PC will be restarted twice or thrice during installation. Please note that the installation procedure might be slower as you are installing Windows 7 to an external hard drive. Step 11: Once done with the installation, you are good to go. You can install all drivers and other software to start using the best Windows version on your PC. Note: We have tested this method to install the x86 flavor of Windows 7 to Seagate USB external hard drive. But should work fine with x64 as well. Users who would like to carry Windows 7 on a USB flash drive can follow our how to carry Windows 7 on USB flash drive guide. UPDATE: If you’re having issues with this guide, please go through our how to install Windows 7 on USB with ease guide for easy instructions. Not sure why the WinToUSB option is so discretely hidden at the end of the post, when it’s not only the easier, but the generally better option. Doesn`t work. I have BSOD 7b during the first boot, the most probably because Windows does not use USB driver for SATA. Don`t suggest to change SATA settings on IDE, it is not present in modern laptops. If you don’t know what to do with this, why did lost time to read this article and post a bad and erroneous comment ? How about this? Make an image of your current internal SATA WIn 7 OS with say Macrium Reflex, then reboot with the Macrium CD and clone the image onto the external USB (which could be an SSD these days). You can use a BCD editor then to create a dual boot menu for both drives or simply instruct the BIOS to boot off the USB which mine can do. I often do boot off a memstick (pendrive) using FAT and Win 98. I wouldn’t try to install Windows 7 onto a USB drive, but why not clone over the image? What should I download and what should I install? This is useless as it requires the boot sector to be at C: which already contains Windows and it cannot be booted separately from the fixed drive. Worse, now the internal HD will not boot without the ext. Ridic. Who needs this? 2 windows 7 installations? The script doesn’t contain any malicious code. Could you please tell that antivirus software that you’re using? Thousands of users have tried the script in the last couple of years without any issues. Please check the following link to results from VirusTotal for the batch file. As you know, VirusTotal uses over 50 antivirus engines to scan each file. READ the contents of the batch files, is is a VIRUS and rewrites your registry.to destroy your MASTER BOOT RECORD on your system disk! You will NOT be able to reboot your box without the Windows install CD. The only thing that works right is ImageX.exe, all other lines in the installer.bat which manipulate the registry or call up DISKPART or BSDBOOT should be deleted. You will have to go online and do those by hand. ALL positive comments with smiley faces in them are OBVIOUSLY fake, I did not read any of this page before starting to do this. STAY CLEAR OF THIS HOAX, IT’S A PSEUDO-VIRUS !!! OR HIDDEN BOOT OR NTLDR DIRECTORIES. THE INSTALLER.BAT SCRIPT SCREWS WITH THE REGISTRY, I HAVE NO WAY OF KNOWING WHAT THE HELL HE PUT IN THERE! ON TOP OF THAT, IT KEEPS DELETING MY MASTER BOOT RECORD ON MY SYSTEM DISK. NO WAY IN HELL A LAYMAN IS GOING TO CREATE A WORKING USB STICK WITH THIS WITHOUT IT PROPERLY EXECUTING BSDBOOT.EXE AND BOOTSECT.EXE CORRECTLY. NEXT…. IT USES SOMETHING CALLED USBBOOTWATCHERx##.EXE, THIS IS SUPPOSED TO ALIGN THE DRIVE TO BOOT IN 32 or 64 BIT BASED ON WHAT YOU SELECTED. IF YOU CREATE IT ON A 32 BIT SYSTEM, CHANCES ARE IT WILL DESTROY YOUR SYSTEM DISK MBR AND YOU WILL BE RUNNING AROUND LOOKING FOR A WINDOWS BOOT CD. NEXT…. IF YOU MADE THIS ON (EX:) AN XP SYSTEM FOR A WINDOWS 7 USB STICK, MOST LIKELY THAT WILL NOT WORK EITHER. ACTUALLY, I DO NOT BELIEVE THE O.S. MATTERS! THE FACT THAT YOU ARE TRYING TO DO THIS FROM A DOS BATCH FILE IS LUDICROUS! allow your Windows CD to “Load Files” until finished, then start creating the new system in WINDOWS.0 directory, Now PULL THE POWER on your system. Reset your boot device back to the system disk, FORCE the booting of the SECOND menu option (it changes boot.ini to 1 second, so you have to jump on it!) and regain access to your PC. Go into System Properties/Advanced/System Startup and edit boot.ini by hand. Remove all likes that contain “WINDOWS.0” in them and reset the delay time to 6. FAR FROM COMPLETE and needs WORK, lots of it! versions of BSDBOOT, BOOTSECT and IMAGEX in there! God man, what a FIASCO! Why the HELL didn’t you make separate batch files for separate goals? 0% ] Applying progress The Wim file Applied O.K. Processing the Registry and usb boot watcher . . .
Maybe it can be done with ease but not with such confusing instructions. For example, your first step says to ‘ Download the ZIP file from here’ without saying what zip file it is and then you talk about it and the WAIK together to add to the confusion. When I disconnect my external hard drive, I can not boot from C: internal hard drive. I need to have both drives connected to use Windows. I tried to use the script given here [http://reboot.pro/topic/10126-nt-6x-fast-installer-install-win7-directly-to-usb-external-drive/] to enable the hard drive to be used on other computers, in order to see if it will solve boot problem, but I received a sysprep serious error. I tried then the solution of using a graved Windows ISO to use repair function on both Windows installation, but so far, effects are not noticeable. BADLY needed clarification: you have to partition your target drive first, in disk management. first delete all partitions on your empty target drive by right clicking in diskmgmt. then create simple volume, 100 MB, NTFS, drive letter R for example (this is = system reserved aka the small sector containing boot loader for windows) and quick format. Next format the remaining large unallocated space, to K (or whatever letter other than A, B, and cant use C because the computer youre running this cmd on already has a C drive) NTFS and quick format. Then run the installer.cmd. Then the first prompt for OS partition thats where windows files will install, in my example K drive, and select R drive as the boot drive. If this method actually worked these are the steps you need but I think this guide is broken, or I cant find a solution for the life of me. wintousb doesnt work, as selecting my drive in bios afterwards it still wont boot, just crashes. Does anyone know if this prodecdure works with Windows 10. I would like to install Windows 10 on an external disk. When this is done, will the current C: drive be whiped and ill have to use the External hard drive from then on? or will it just create a 2nd install and give me the option on the boot menu? Tried using this before reading the comments. Now my computer won’t finish the install. It bluescreened, and now it keeps saying that that installation was interrupted and it needs to restart the computer and restart the installation. What do I do? How can I revive my computer? One of my biggest frustrations with the Net is people who actually know less than they want people to think they do. I am wanting to put Windows 7 Pro 64-bit on a stick, and i am doing some reading to see how to do it. I just wasted some valuable time reading this crap. One good soul at least warned us that using this method can damage our C drive installation of Windows as well! Flush this stuff down the sewer and give us GOOD instructions on how to create a bootable Window USB drive. Hi i followed the instructions and successfully installed Windows 7 on an External Hard Drive.However after Windows was installed when i tried installing other programs i kept getting File System Corrupt messages.Went through CHDSK and even then kept getting File System Corrupt, couldn’t even complete sfc completely.All told i spent more than 2 hours and my C Drive on External Drive is useless except for booting up Windows 7.Waste of my time.Now I’ll just Format it and Install Windows the normal way.Thanks for wasting my time! This guide was originally written back in 2010. There were no easy-to-use tools back then. What I don’t understand is, why this long way, when you can use the “how to install Windows 7 on USB with ease guide” is there other benefits of it ? You’d better use WinToUsb 2.0 beta. It works fine and it’s free. You’ll need windows 7 installation dvd in iso format. dear friend, why do you make a fool of all of us? Nothing works by your procedure. Only result is blue screen. yep tried it and I must be missing something because it showed a blue screen after the first reboot to finish install.??? I just want to warn you guys, these instructions will mess the OS which is installed in your internal HDD and will corrupt your system files. This article is invalid. When I run the installer it tells me I need 521 my of free space on any partition for temp files to install Windows. Free enough space and restart installation. I have gigabites of free space on any number of partitions including my primary active. So I have a question which may seem dumb, but I’d rather be safe than sorry. My mom’s laptop is broken and I suspect its the hard drive. I’d like to install windows 7 onto an external hard drive and run the laptop from said drive. I just want to make certain that I won’t change anything on MY windows 8.1 computer when I use my computer to install the windows 7 operating system onto the external HD. This process works great for Windows 7 but installing with Windows 7 SP1 ISO or after installing updates through Windows Update causes your installation to blue screen. However, if you do not install any of the Windows 7 updates, this will work great. @dinescu : the install.wim should be at this path: Windows Files/ Sources/ install.wim after you copied your Windows 7 installation files like in step three above. The installer cannot find install.wim. When I hit enter to search nor if I manually type path…please help!!! yeah it works…….but I’m guessing that for most people after reboot it’s not an automatic spoon-fed menu installation……..it’s manual and involves using Windows SIM which appears in the start menu after you reboot……there’s instructions on what to do on the web if you search it…..it’s not hard, just really freaking tedious. the same thing that happened with everyone else who commented here; works fine up until you reboot to finish installation. at first I thought this was because I installed the iso image into a ntsf formatted partition on the external hard drive and it had to be FAT32 or exFAT because another blog this author wrote stated something like “in order to boot windows from usb you have to use UEFI and not Legacy” (which I’m assuming is the default for most machines?) but then when you reformat the external hard drive where you want install windows as exFAT or FAT32 the “fast installer” gives you the message “disk is not ntsf format, reformat disk to ntfs”. You can use this method to install a new clean version of windows in place of the one you have; all your data, settings, drivers and software are erased though so if you want you want to keep them you have to back them up beforehand. to do this you input the same disk for both the Active partition and the installation partition. I used easyBCD and f**** up and deleted my BOOTMGR system partition and now I’m in this mess like the rest of you! Luckily, I had saved ALL of my data (pictures, music, documents, etc.) in a separate partition so retrieving my data was super easy. I took out the 2.5” HDD from my laptop and used Fosmon Technology USB 2.0 to 2.5″ 3.5″ IDE SATA HDD Hard Drive Converter Adapter Cable + AC Power Adapter (it’s $9.95) to connect HDD to my asus netbook, and then I transferred all my data (107GB in 1 hr over usb 2.0). I then formatted the HDD completely and erased everything. I don’t have a flash drive now and the one I ordered will arrive in 2 days, so I hope that I can put Windows 8.1 on the USB flash drive and that the empty HDD inserted into the laptop will automatically be able to install the OS and everything will be fine (hopefully). Anyway, I hope you can all retrieve your precious data! Remember, always have two partitions: one for your system and one for your data. Hi, thank you for the effort. I want to try it but i noticed that those who ask for your help concerning there “BOOTMGR is missing.” problem don’t get any response? What does it mean? this does not work. everything installed correctly, but once it told me to restart my computer what do I do then? I boot up the install disk still says I cant use a usb, try and hook it up on the computer I am going to be using it on and its missing the BOOTMGR and another g something file. really wish people wouldn’t put things like this online unless they worked. ATTN!!! BOOTMGR is missing solved! You must be able to get into recovery. After following the method above and you get bootmgr is missing you need to disconnect your old hard drive. Then when you do start up repair it will repair external drive and then will boot. Yeah so when I load the install.wim, no images show up at all. I guess it doesn’t matter as this author isn’t doing jack **** to help anyone. Thanks for nothing. I have a company HP Elitebook 8470p. Because I don’t have any privileges in Windows, I want to try this tutorial out. (1) If I take out the internal drive and try above method, will it then create a separate MBR partition to boot? The problem is that booting from another drive/boot partition is locked by my company (tried it with Ubuntu). (2) I also don’t want to make changes to MBR partition of that internal drive so I won’t get in trouble with my employer :) When I re-add the internal drive will it then keep 2 separate MBR boot partitions or does it merge it? I just noticed that it says “external hard drive” specifically. Does this method work on usb FLASH drives? I have the same problem as Archmaester. I get a “BOOTMGR is missing.” every time i try booting from usb. I tried repairing with a Windows 7 dvd (both automatic repair and manual from command lines) , nothing help.Anyone knows how to fix this? Please help i got this error message. A required privilege is not held by the client. The Wim file applied O.K. Press any key to exit.. I am sorry to say that but your guide only worked for me until step 9. When the copy process was completed, I tried to reboot from the Install DVD, where I got the usual error (cannot install on USB …) and the try to reboot from the external HDD just gave me a flashing _ . So, what did I do wrong? 1) Would it be possible to install Windows 7 on a SSD plugged into a USB docking station? 2) After installing, is it possible to put the SSD inside the notebook and boot from there, or will there be disk-letter problems? Thanks you very much, the system was installed perfect !! !… Easy to do with your instructions. Can I use windows7 installed external drive with different computers? This is a so important. If I can’t, it doesn’t make sense having windows7 on an external drive. Thanks for your comment. It should work fine. I have tested it. Are you getting an error while attempting to boot? This one didn’t work on me: https://www.intowindows.com/how-to-install-windows-7-on-usb-flashhard-drive-easy-way/. Tried 2 USB disk and 1 External HDD. It works fine, done it with a few different external USB Hdd’s and systems . A internal Hdd has to be present on some systems as device controller will not work without one. For those who seem to install OK but then complain it still boots to the Internal HDD :doh: you have to choose the USB external drive using the machines boot options at start up. I have an external drive Samsung S2 Portable, 500Gb. After finishing with the green instalation screen, I re-booted chosing to boot from USB. BIOS recognized the external HDD, but when comes to boot, a blinking underline cursor on a black screen appears and nothing happens. Is it possible that my external HDD does not have the posibility to boot? Why is mine saying wincmd cannot be found? Also it is not finding setwimpath?? The metod isn’t work for 100%. On some hw just doesn’t work. it works for me,thanks a lot for ur help. Has anyone that got to the install and got ‘can’t install to USB drive’ managed to get it working? What is the point of this if i still need to have my original boot drive in my pc in order to boot from the external usb? I don’t think it’s possible when you have installed Windows 7 on external using the above mentioned method. Is there away to remove the Windows 7 option from windows boot manager after the install is complete? so my computer just starts like it used to? One other thing; there were 3 versions of Imagex.exe on my laptop (for some reason), one of them is the 64-bit version and the other is the 32-bit version. 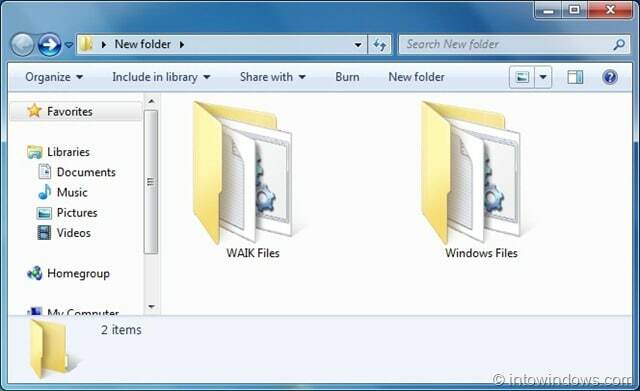 Just ensure you have the correct version for your OS inside your WAIK folder. They can be found at C:\Program Files\Windows AIK\Tools\x86 and C:\Program Files\Windows AIK\Tools\amd64 respectively. So far so good…….. The file “Imgex.exe” is actually “Imagex.exe” : Note the “A”. This is real confusing unless you search for the answer as to why this can’t be found in the WAIK installation. Thanks though for a great article. Im on step five and im using Windows 8 64bit os and whenever i click my install.wim file it says this app can not run on your pc ? Select the install.wim from your Windows Installation DVD or image, but not from the “Windows Files” folder you’ve created previously. At least, that has worked for me. I needed to mark the partition active (using diskpart), and use bootsect /nt60 [/mbr] on my usb drive letter, before it would boot from the usb. 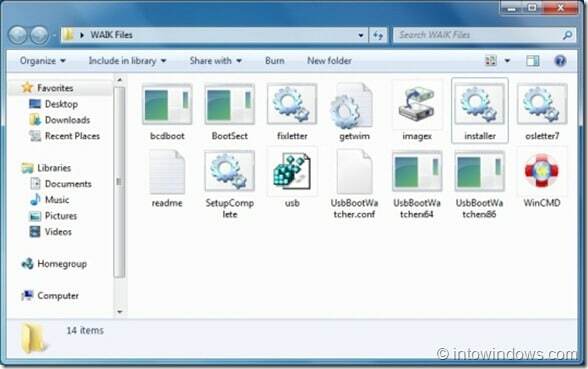 diskpart is on any Windows 7. bootsect is one of the files that is copied into Waik Files folder. Hello I want some help. I tried a lot to install windows 7 to My external HARD DRIVE but I have not succeeded yet . I have done the whole procedure correctly but in the end , at the time of installing windows 7 I got message that “windows cannot be install to this disk . setup does not support configuration of or installation to the disks connected through USB or IEEE 1394 port”. please help me out of this error. Hello! While trying to do this, in the image number, there are no images available (to choose which version of windows I want to install). Does anyone else had this problem? Any ideas in how to solve it? what is the diff between drive letter of ext hd and drive letter of active partition(step 7 and step 8) is thedrive letter of active partition the drive in which win 7 is alredy installed in internal hd? does this work on ubuntu? For those facing Blue screen. It means that the new hardware (for the usb hard disk loptop) were undefined so. 2- Start the original laptop and it will start the installation windows and begin to identify the hardware. Hi! everything was fine until i reboot..
windows cannot be installed to this disk. Setup oes not support configuration etc.. I got to step 10, but when I try to restart the computer to install the OS, it won’t start the installer. I get to step 10 without errors. My green screen looks exactly the same as yours. But when I reset my PC, it boots only to my main HD. I cannot boot this drive on this or another PC I have to finish the install. What am I doing wrong? I have installed windows 7 on my external hard disk and it is working fine with my acer laptop but my another dell laptop on boot displays blue screen. Has anyone else had this problem and/or know of a solution to it? Ah! Ubuntu in external hard drive. No problem. Anyone else is expecting error at step 7? i go all needed stuff, all if fine, disk set as primary active 25GB but when i set the LETTER of USB DRIVE, press Enter….and its gone,it fails with no error, just disappears. Anyone any ideas? yes i am running it as Admin..
ERROR-Failed to get target OS drive letter info from registry. When I go to boot from cd, selecting where I want to install shows no drivers. Heads up everyone if you experience my problem, I solved it because I missed the “Run installer.cmd” as admin. Hello, I am through to the step where I select my active partition. It is “C:” for my computer, yet when I enter “C:” or “C” it states it is an unwritable disc and to enter a new letter. What does this mean? I’ve completed all the steps as shown but when I try to boot from the drive I’ve put the os on it needs a boot loader/mgr. Why? Thanks for all this help, I just made it and works fine. The only one problem I’m having is when trying to install .Net framework 4 or Sql Server (tools that I’ll need in my image), it is just crashing and don’t know why… Do you have any idea that could help me with this?? I’ll really appreciate that! Hi i did everything and it was ok, but when i try to boot it on the other laptop it say windows operating system couldn’t be found something like that , how can i fix this? i’m using 32gb flash disk, because my internal hard disk is having a problem and i can yet afford to buy new Hard disk, thats why i want to use my 32 gb flash drive for the mean time. Access denied failures when writing image? Turn off your antivirus. Well, thanks for the suggestions. This procedure enabled me to rescue a hard disk that was not booting. It was necessary to boot my broken PC from an external USB hard disk previously prepared from another computer. I want to clarify general aspects and some variations that were necessary in my case in order to make everything work fine. Second: The software: Automated Installation Kit (AIT) must be downloaded from the Microsoft web site, as it comes in ISO format it is necessary to burn it into a DVD in order to install it later. Third: In my case, after I ran the “installer.cmd” file and I finished up loading Windows 7 in my external hard disk, it did not boot and I could not continue with the Windows installation. I repeated this process several times without having success. SOLUTION: Make a quick format to the external USB hard disk and then use on of the multiple procedures found on YouTube to make a boot from an external USB memory. Apply it to the external USB hard disk, I used a simple software called “WiNToBootic.exe” that left my external hard disk booting perfectly. After this, go into the external hard disk and erase all the files copied, the only files left are the hidden boot ones. Then, continue normally with the process of running the “installer.cmd” file as an administrator and all the other steps described in this blog. In the end, when the boot from the external usb hard disk is required to finish the windows installation, unplug the disk and connect it to the PC in which you wish to recover your lost information. The external disk will boot up normally to finish the windows installation, then go to the broken disk to rescue your lost information. Thanks for all you comments and I hope it works for you. I followed all the steps, but when i run the windows intaller, it still says me that windows cannot be installed in am usb :S, after i do the first boot nothing happened, i dont know what to do. Hi , thnx for info, but I have a question. If I want to boot from usb external hdd. for example if I don’t want to use my hdd in laptop at all. I need just create for example, small active partition on usb hdd , and primary. And in step when we choosing letters use them? I went through all the steps but he installation doesn’t start after the reboot. When I start the installation from either the Windows Files folder or a DVD it still says that I can’t install on a USB drive. I’m using a hard drive in an external enclosure that has it’s own C drive as it’s boot drive. As my external drive it is the F: drive. My only thought was that in step 8 it is asking for the Active partition. I chose the F: drive. My concern was that if I chose C: (the active and boot partition for my laptop) that it would compromise my laptop. Thoughts/ideas? This ruined my OS. I got to step ten just fine (hadn’t installed windows 7 yet) rebooted after the WAIK green screen part then when my PC tried to boot up my standard OS, it fails. It thinks its trying to boot windows 7 and gets confused and restarts again and again. I checked the boot sequence in the BIOS to make sure its not trying to boot from the external and even unplugged the external. I can’t even get into safe mode or anything. May I add: you may have to use the imagex.exe file from a different architecture than you would think: I am going thru this procedure for a Thinkpad with Intel core i5– and it only worked with the imagex.exe file from the “AMD” folder in the waik files. Congratulations, I use this procedure and all is ok… thank you for that help about “How To Install Windows 7 To USB External Hard Drive [Must Read]” Felicitaciones por este procedimiento para instalar Windows 7 en disco duro externo. Todo muy bien. Gracias por todo. HELP HELP HELPP HELPP …. ALL WENT WELL BUT AFTER ALL PROCEDURE NOW AS I M TRYING TO BOOT IT IS. SHOWING A WINDOWS LOGO AND THEN BLUE SCREEN (BSOD) .. BUT THERE IS NO SATA.. IN BIOS SETTING..
Hello, i successfully installed my windows 7 to external Western Digital 500 gb. but when i boot from my Sony Vaio, it says “no: grldr”. so i troubleshoot it using my PC, the PC boots from the external HD but then works fine.. how to fix the problem when i boot my external HDD to the laptop? please help..
Link could use updating for AIK also. The one you gave leads to Vista installation. The files might still work, but the Windows 7 AIK iso is a little over half a gig larger. I though I followed then instruction 100% but when I try to boot up from USB, then LP boots up like normal, just a bit slower!? Any idea? bootsect.exe is in your windows installation files! after extracting the installation files from the iso as instructed, open the “boot” folder and you’ll see bootsect.exe. make a copy of it and put it in the waik folder and you’re ready to start! I’m trying to do this on a Mac, All works up until booting from the USB at which point I get the Blue screen of Death (BSOD). I saw some people mention disabling the SATA in the BIOS but the mac has no BIOS :( has anyone figured out an alternative to this or is there a way to inject hacked drivers to the windows startup so that it can bypass the SATA controller? Hi, thanks a lot for the great walk-through. For anyone who is interested in getting WAIK Tools w/o loading the huge ISO’s, below is some information with a great little tool someone created. Hope this helps. when i try to select active partition it tells me that the partition is not writable, please help! I got this to work as well. Even on an older laptop with a Pentium M. It’s slow but works well! please Give me Solution used in any computer in external HDD win 7 32 Bit. I have done this and all runs perfectly with the exception of the virtual memory as the paging size resets itself to 0 every time I restart my system, so anything that uses a lot of memory cannot run. It works with 64 bit windows also. runs a little slower than having an actual HDD but surprisingly fast for a portable HDD. just follow the steps and make sure everything is good. Hey i completed every step and even booted it succeesfully on the laptop i did the steps with, but when i try it on other computers, it says “BOOTMGR is missing press ctrl+alt+del to restart…” anyone able to explain how i get around this? hard drive? I installed the win7 pro onto my WD hard drive with the helpb of this document but after a windows update I cannot boot it anymore. I have install Win7 according to your instruction on an ASUS MB, HP Notebook, LG Notebook. I was able to install it on my Fujitsu netbook, only if I set the SATA to IDE mode. Is there a way to slip in the AMD SATA Controller? Your approach bypass the F6 in phase I of Windows 7 installation, where one could load the special storage drivers. Please help, I tried injecting the drivers into the BOOT.WIM and INSTALL.WIM, but always get the BSOD during step 2 of the Installation. The link to downloading the files into the “WAIK Files” folder doesn’t exist can you please re-upload the zip and repair the link please? Can always email me the zip file if you can. Thanks! I have installed Win7 Pro and Ultimate a couple of times according to the original instructions (1.) . It worked perfectly. The problem is that installing some applications, windows updates or even uninstalling applications will cause BCOD or failure to boot. I cannot figure out how to fix these problems. This method works as described. the correct md5 of KB3AIK_EN.iso is 1e73b24a89eceab9d50585b92db5482f. Does anybody have the files from Step 1? Link is broken. Then I plugged it in my desktop and all went well. I have installed windows 7 on my pc from USB by usings the steps that you have mentioned above. can n e 1 help me out this…. THIS WAS AWESOME. THANK YOU SO MUCH! I have a laptop that has a password protected BIOS. I wanted to format and install windows 7 from USB however with the BIOS locked i couldn’t boot from my USB without taking apart the entire laptop to get to the battery to reset it. After reading this i simply removed the HD from my laptop and used an adapter that made it USB accessible (USB 2.0 TO SATA/IDE). Followed the directions and when time came to reboot i just removed the HD and put it back into the laptop and started it up. LOW AND BEHOLD it booted right into installation and now everything works fine. THANKS AGAIN FOR THIS TUTORIAL! hi, i do this with windows 8 and working, i use windows7 ultimate x64 and i install win8 32bit to seagate expansion 320gb. imagex.exe[find in my friend pc,i think its for win vista] bcdboot.exe[find in win7 drive C: ] bootsect.exe[find in win7 enterprise dvd] in step 10 i restart my laptop and after rebooting its boot to win 7 i restart again and boot win8 and do install progress until chose partition and close setup, rebooting system and boot from my hdd, win8 coming and so nice :D i play pinball in win8 and its amazing. i shout down win8 and disconnect my hdd, turn o my laptop and see blue screen say need usb or disk, i put win7 disk and boot this and use system recover, automatic find problem and fix, rebooting and boot to my win7 but now my microsoft essential security say windows did not pass genune validation, and see under screen in my background this copy of windows is not genuine. this is good have OS on portable hdd but lost your win on internal hdd, its should have a boot menu to chose..
Hi. when i restart the computer it says error starting system on usb. FYI:Yes, you can install to a USB. Thanks to your site instructions, and a little work, I was able to install Windows 7 to a Patriot 16GB USB drive. It works just fine, except it’s a little slow, which is to be expected. Step 6 is not working for me. iam not getting any images and index numbers. Please Suggest me how to get index numbers as step 6.
okay. more problems. the external that windows 7 is installed on will only run if it is plugged into the same port every time. when i plug it into a different port on the same laptop, i get “registry failed to start.” what is going wrong here? it will work only in the laptop i installed it with, only in the same port i originally used. and apparently “loses” its OS when i try to use the external on another laptop, even when i plug it back into the same laptop. i have to reformat the drive and start from scratch every time. from experience test it’s a bit slower than normal if you have a strong pc hardware specially the cash and ram capacity you will be more than fine. i have a problem. i run through all the steps. it loads up windows 7 just fine. but then two things happen: when i plug the usb into another laptop and boot from external HDD, i get “Operating System Not Found.” when i plug it back into the original, i get either “Operating System Not Found” (if using boot menu) or a blank screen (if starting from BIOS). i did the step to make the usb portable on the usb OS. what do? Ran into many errors tho. The EasyBCD is very important to make it boot from usb external hdd!. find guide on youtube for this! I am now running my laptop from usb external hdd with windows 7 ultimate! I tried all the steps and always get “BOOTMGR is missing. Press Ctrl+alt+del to restart” No matter what I try. I used win repair via the consol x to rebuild the BCD file (strangely, after the installer.wim finishes, no “x:/boot” folder is to be seen on the USB HDD partition, it is on the original internal C:\ hdd). Manual add of this file and folder causes error “\Boot\BCD Status 0xc0000000f wrong boot configuration data” to appear. I am sorry but the procedure is wrong, the Windows can not be installed into an external Hard Drive! When I Boot for Installation the external HDD always is not acceptable even if I followed exactly the procedure predescribed! this one really helps, i followed it step by step, now i do have an external usb hdd on with win7 it. THANKS A LOT!!! Once i get to step 4, it says that image.exe can not be found when it is clearly in the folder!! Very frustrating!! Sorry for commenting this late. But I can confirm that this guide works 100%. I can’t find Imagex.exe on my computer. After I installed WAIK I found Bcdboot.exe and Bootsect.exe. I would like to add, I have been trying MANY methods to try and install/run windows 7 on a External USB device. This worked up until I booted like normal, and it intsalled drivers,services,Windows 7 Ultimate..Then I got the bootloader error message.. However, all I did is reboot the system like normal and allowed the MAIN computer to allow so time to recognize the USB drive and it worked without a hitch. THANK YOU!!!!!! Man I have spent along time searching and you have been a Godsend!! when I start the Installer.cmd it asks me for the Install.wim but when I open the Install.wim it says tat this version of Installer is only for windows vista not for windows 7 that you are running. what can i do about this? Is there a Installer for computers that are running windows 7? Hey Thanks Anyway for your work,but i can’t find imagex.exe, can some one help me please ? Having a problem…. 0xc0000001 winload.exe is corrupted or something like that.. how to resolve..? im getting the same error message which i was getting earlier…. windows cannot be installed on this drive message….can anyone tell me what have i done wrong?i have followed the exact same procedure which has been given on top still im not able to install it on external harddrive…. First: There are 3 files named Bcdboot.exe; 3 files named Bootsect.exe; and 2 files named Imgex.exe. Exactly which one of all these three do I need? Second: I am reaching successfully step 9 but then nothing happens- no progress indicator, nothing…. Why so? Any suggestions? I keep getting the Blue Screen of Death when I go to load Windows 7 that I installed on my external hdd, according to these directions. happens as 7 is loading. what am i doing wrong? I would really like to get this to work. I have a RAID system that is down on me, and I can’t do any rebuilds to the RAID without Windows running, well that’s the problem Windows won’t boot because my drives are in a ‘Degraded’ state. So I would like to get Windows running externally so I can try to rebuild the array instead of losing all my data. My data is still there cause I can see it when I load Windows XP in to the Recovery Console after the(F6) install. So I preformed everything in the main How-To..After my first error “Error Loading Operating System” I rebooted and it actually started to finish the install, but once it rebooted again the “Error Loading Operating System” is back with the black screen and it stops there. This is the same error I was getting when I tried to directly load my original Windows XP straight to the USB drive. I’m stuck now. Does someone have any good advice that will help me? is there a way to set the swap file? i did followed the tutorial for my wife’s computer. windows boots up file, but all of the ram is used up making the machine lockup easily. she has 2GB ram. the reason i am using this system is that her onboard hd controller burned out. Excellent tutorial. I had it working though it cost me a while. I had a recurrent blue screen as mentioned in many of the posts. I thoght the exteranl disk was properly flagged as active and bootable and it was not, i was using a diskless pc with a bootable hirens cd usb key (mini windowxp, diskpart, and diskgenius). What it worked for me was using a linux tool, gparted, and flag the partition as bootable. I have to mention that the 3 files required from waik can be obtained from a winpe cdrom once the computer is booted. The catch is that to make a winpe you need the waik … If anybody needs tehm files I might be able to upload to megaupload or similar. I must be doing something wrong here. I’ve tried this with like 3 different windows discs and each one either gives me a BSOD during “windows is installing devices” or freezes at that time without a BSOD, at various different times. Tried disabling SATA controllers in BIOS, didn’t help. First, can someone clarify: which folders do we get the Bcdboot.exe, Bootsect.exe and Imagex.exe files from? There’s 2-3 of each. Google seemed to say use amd64 for all 64 bit, and x86 for all 32 bit, but I can’t be sure. Maybe that’s my problem. I’m a very experienced computer user, so the fact that this won’t work for me is frustrating. Any ideas? When I made my USB drive ‘active’ with dikspart.exe, I can type the USB drive’s letter at the active drive question? So, with this, it will boot from USB drive? Please, at step 6 the Install.wim program seem not to read imagex file, because, it is not showing images files to select the ultimate version. *read……. * WTF? I NEED THE C DRIVE TO BOOT FROM THIS? well that’s pretty lame and useless. I want a portable OS and not the lame one booting from Virtual box. I can install Grub and Ubuntu to this external drive, why does Microsoft have their heads up their asses? I’ve tried installing Win8 using this method and ended up with 0xc000000f error (“/windows/system32/winload.exe file is missing or corrupted”) during booting the windows. 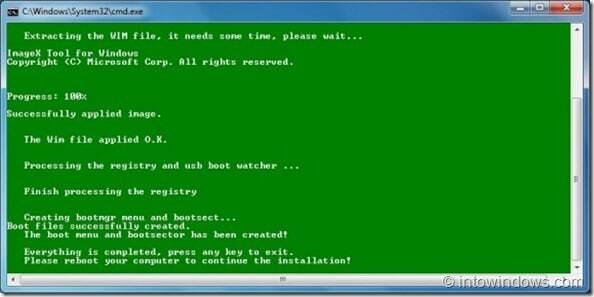 Anyone succeeded in booting Windows 8 from USB drive? @Vincent @Ray, were you guys able to sort out the windows 8 install issue? I’m thinking of installing it on an ext hdd as well but I want to know if it’s even possible. Did you try setting the boot order to USB first? (assuming it’s a USB external you are using) I’m just guessing here. Also, I’m trying to install Windows 8 Developer Preview on an external also, but I get stuck at the “Preparing” Screen and the spinning circles. Seems like my external’s not doing anything either so I guess the install got stuck. What did you do exactly? I couldn’t find the bcdboot.exe or imagex.exe from the Win8 ISO so I used the one from Win7. Any info would help me…thanks! In an effort to install Win8 on an external with Win7 on my internal I followed instructions and everything appears to have installed properly. When I reboot though the normal Win7 appears and cannot figure how to get Win8 started to get a glimpse of what it is about. Any suggestions or clues? Thanx. Thanks! The instructions worked out great. Theres a typo on the filename imagen.exe (from WAIK). My only issue is everytime I boot this os (which I sysprepped to use on my ultraportable) the “performance options” menu opens and the virtual memory settings I set & apply never persist. I’m stuck, only thing else I can imagine is an upgrade install, which, due to the nature of this original install (to ext usb) I fear will ruin the install. Opening the Windows Disk Management tool (type diskmgmt.msc Start menu search field and press Enter to launch it). now and click the right mouse button and then click => mark partition as active! You must restart your system after this step! After the setup is done and I reboot the pc nothing happens for one. It just loads my regular Windows 7 copy and when I select to boot from USB External Hard Drive it gives me an error saying “NTLDR is missing”. Please help me on fixing this problem I need this to boot from USB and work for my school work. THANKS IN ADVANCE! Hi. Is there any place where I can get the bcdboot.exe, bootsect.exe and imgex.exe files? My internet connection is so slow I can’t download a 1.66 gig iso file just for three files. Help would be much appreciated. Thanks! How can i set my pc to boot automatically from int hdd if my ext hdd is not plug in. any idea what i can do??? It worked with someone? I read all of cometary and not met anyone who said it worked. And the author does not answer any questions. I think it does not work or we’re all doing something wrong. It is important to the author comment on whether it really works or not and help visitors. Unfortunately I have not found anywhere else on the internet running Windows 7 by an external hd. If anyone knows, please here. In the procedure described by fujianabc not to do anything after running Install.cmd. It is assumed that after the process, Windows 7 is already nstalled on the USB disk. I reboot my computer and is impossible to start from my USB Hard Drive, simply, it is ignored. When I try to continue with the normal installation, it displays the same message thet does not let me install on a USB Hard Drive. Does this really work?. What to do to start the computer with the USB hard drive? Thank you for your tutorial. Is very intsresting. I use a 32GB USB Flash Drive. Your procedure works with an USB Flash Drive? When I reboot my system, nothing occurre, I run a W7 Setup and my flash drive not shown in disk list. Also i wish to have a reply soon if i may. The installer has been on “[ 98% ] Applying progress” for over half an hour now… Is that normal? Question: After installing Windows AIK, I searched for the files, and there are two or three of each one. Do we need the ones in the x86 folder, amd64, or ia64? If I do all the above instruction in my pc and then, I use the installed window7(in external hard disk) in my laptop, will it works?? hi.. all you step is correct for me but when i start the computer and set in bios to my external hdd computer said BOOTMGR is missing, what is problem? Hello! I don’t know if this is the place where I should write to. I can’t install any version of windows on my laptop, because it seems that the CD-DVD drive does’n read the cd(s) to the and, and it gives me errors. My question is: how can I preinstall the windows to the hdd (from another pc) an then, when I power on my laptop, to start the instalation process directly from my hdd. The Bios doesn’t give me the possibility to boot from LAN or USB, only HDD and CD-DVD. Download links updated with your new link. Thanks for the same. “The required ZIP in the step 2 can be downloaded from here. seems very interesting only to point on issue 2 isn’t clear to me. You have to download a zip file but I cannot locate which one as it shows several with the link. Which file needs to be downloaded? Which files are in the packed file. Hi. The procedure goes on until 87%. The installation stops. Is my HDD faulty or what? and the installation continued and completed sucessfully. I’m also having issues with winload.exe. I tried changing the directory to sys32\boot\winload.exe, which doesn’t work. I doubt copy-paste-replacing winload.exe’s will work. I tried both drive letters for the boot partition. I’m suspicious that something else is wrong. It may be my GRUB bootloader, but who knows. I’m kind of confused as to how we’re supposed to follow the standard installation process if it can’t install to ext hd. Also, doesn’t the AIK install to the hard drive already? Nice tut, but I get an error. My system can’t find winload.exe. I have tried several times, but it won’t boot up from the external hdd. Can anyone help me.. i did all the steps.. that went fine then i tried booting from usb.. it starts to load windows and then i get blue screen.. any help ?? i,ve done step 1-9..and it was smooth..
thanks for the advice, but when i reboot my laptop, to reboot it to my usb hdd external, it cant install windows 7. when i install win 7 on my usb hdd external, its say cant install win 7 on this disk, plz help me. am waiting 4 an answer. Not sure what I am doing wrong. Everything installs fine and it says 100% complete but when I reboot the computer I attempt to boot from my USB hard drive and it says kernel is missing. Can anyone help me? I have a netbook with a bad hard drive. Is it possible to do all the setup on my desktop then plus the usb hdd into my netbook for installation? Hey tktz, I got a new harddrive for christmas for this purpose and could really use the assistance. If you or anyone else could help me out it would be great. I check it often. I’ve got a copy of XP. Would this be compatible with the Installer? Thanks. The required ZIP in the step 2 can be downloaded from here. I want to install windows 7 on my external hard drive. I found your site by google and tried it. the link doesn’t work. Where can i find the zip ?? or where can i find the files that i need to put in the waik folder on the external hard drive ?? If it’ easier for you, you can send them to my e-mail adres. Where do you find the “Installer.cmd” file ?? The link to the Zip file (mentioned in point nr 2) does not work anymore. Could you please update the link? Many Thanks! When i try to download Zip file from 2nd point as specified above, the download links is not working. Will you please update the working link? Can anyone upload a video showing me how to do it?? this works and allows me to boot from my external hard drive. however, when I boot from the external hard drive, it says that windows 7 cannot install to the computer because it cannot configure it. I am trying another method in which in the last step I set the drive letter of the OS partition to the letter of the external hard drive. I tried to install windows 7 another time on my 500gb seagate external hard drive with 2 partitions. This time, I tried the method sucessfully booted to my external hard drive but it then gave me the error that it cannot install to computer from the setup screen. it said that windows cannot be installed on this machine. I have a 500gb seagate external hard drive and am installing the x86 flavor of Windows 7. However, I have partioned the hdd and hope to duel boot with mac osx and windows. I already have mac osx installed and when I boot up from the external hard drive, it gives me the option to duel boot. will I have to ntfs format the entire drive to get windows 7 on it? Hi thanks for putting up the method. All works fine till step No:9 but then it does not restart automatically and if I restart the system it shows up with blue screen. I have also tried to repair by putting the windows cd.. but everything fails at this point. If you have any suggestions please let me know thanks bye. I have met a problem, I have insatlled the operatoin system followed by your procdure, it went well, but when system restarted, the blue screen is appeared, In the safe model, the problem is occured in when loading disk.sys, how can I handle it? Can u please elaborate points 9 & 10 and what do u mean by normal windows installation (booting from DVD or external HDD)? Thank you! All work correctly, but pagefile.sys removes on start… How to made it always stay in system disk?